We at the Healing Rose Holistic Skin Care Center proudly use and recommend the many fine face and body products from Dr. Hauschka. We will be offering them to you for home use through this web site in the near future. 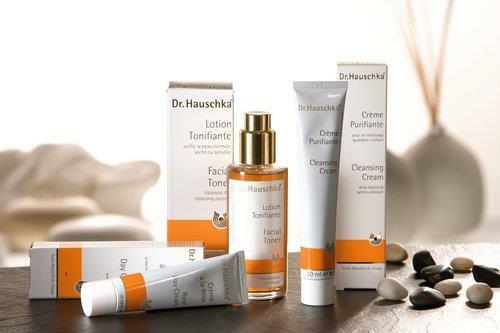 Dr.Hauschka Skin Care preparations provide a complete and harmonious skin care programme. A holistic range, it works by treating specific skin conditions rather than skin types because skin has the ability to change, to balance and normalize itself. Developed during the 1950s, the range takes its name from Dr. Rudolf Hauschka, a chemist who created a rhythmic watery extraction process that helps to preserve and strengthen the living essence of the processed plants and herbs. Wherever possible all herbs and plants used are grown biodynamically or organically in Wala’s own gardens, on approved farms or gathered from the wild in areas which are environmentally secure. They are gathered by hand just before sunrise, when the life forces within the plant are strongest, and, whenever possible, throughout the manufacturing process, hand labour replaces machines. The laboratories at Wala are equipped with all the up-to-date instruments necessary to meet the demands of their own strict and high quality standards. The Center offers a complete line of Dr. Hauschka Skin Care products, including its wonderfully colorful, rich and effective make-up. Among Dr. Hauschka devotees are Madonna, Prince Charles, Stella McCartney, Brad Pitt, Lena Olin, Susan Sarandon, Kate Moss, Angelina Jolie, Lauren Bacall, Cate Blanchett and numerous others.